I truly believe that cooking is good for the soul. When I’m at my lowest of lows I always seem to find myself in the kitchen measuring out the details of a complicated and intimidating recipe. There’s something so comforting about dicing an onion, hearing the sizzle as your ingredients fall into a hot pan, and the smell that seeps into your home as your dish comes together. When things get stressful, you can be certain I’m in my kitchen finding peace in a recipe. These past two weeks have been full of much soul-searching for me. And, as is my pattern, I started to cook. This soup from Smitten Kitchen hit. the. spot. It was the perfect amount of effort and was forgiving enough that my mind could stray from the recipe while I was cooking. 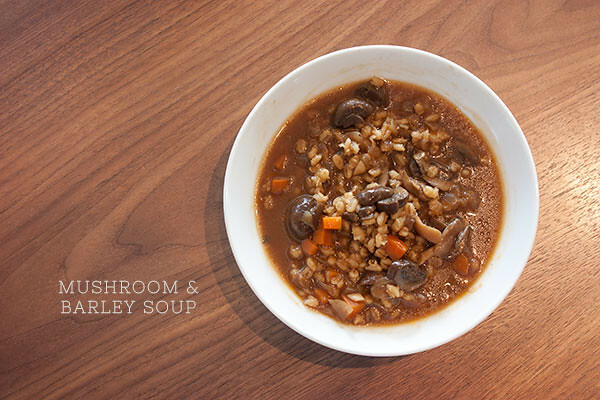 The earthiness of the mushrooms is amazing and the beef broth is a refreshing change from my normal chicken or veggie stock. Whether you’re looking for an escape from a too-long-winter or you’re trying to find a way to cope, this recipe hits all the right notes. I’m already plotting my next soup… Maybe this one. Or this one. This looks amazing as well (and would be much more fitting for the weather in Phoenix right now than a hot soup). Heat oil in a large pot and add your onion and carrot. Saute for 10-15 minutes until your onions begin to brown. Add the garlic and saute for 30 seconds (until it becomes fragrant). Add the mushrooms and cook for an additional 5 minutes – until the begin to release their juices! Add your barley and toast until it begins to take on a bit of color. Pour in your broth, sherry, and tomato paste. Bring to a boil then simmer for 45 minutes until the barley is cooked through. Add salt and pepper to taste. Serve with parmesan for extra deliciousness.